When I reviewed Darkstars, I called it a "forgotten" comic book. Well, I didn't know how good I had it then. I would never have known Bob the Galactic Bum even existed if an ad for it in an issue of R.E.B.E.L.S. hadn't caught my eye. It had Lobo in it, but since in the 1990s every DC Comics house ad has Lobo in it, my eye would have glazed right over it if the ad hadn't also highlighted the presence of Stealth (one of the main characters of L.E.G.I.O.N. and R.E.B.E.L.S.) and the Khunds (recurring DC outer space bad guys). 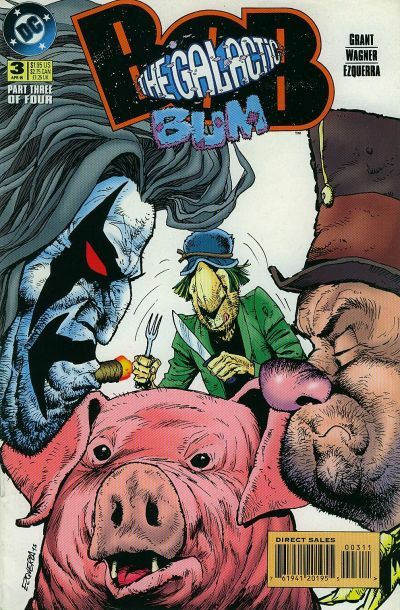 So I googled, and discovered the existence of this four-issue miniseries from 1995. Frankly, it's weird that the only place this is mentioned in R.E.B.E.L.S. is one ad, as it features three characters from the series (in addition to Stealth and Lobo, R.E.B.E.L.S. leader Vril Dox turns up) and it takes place between its issues. Plus, one of its co-writers, Alan Grant, wrote or co-wrote the first 39 issues of L.E.G.I.O.N. Surely DC would have wanted to make sure fans of the one found the other, but there wasn't even a mention in the lettercol. Oh well, I learned about it in sufficient time to add it to my list of "uncollected DC comics set in space not about Green Lanterns," so how was it? 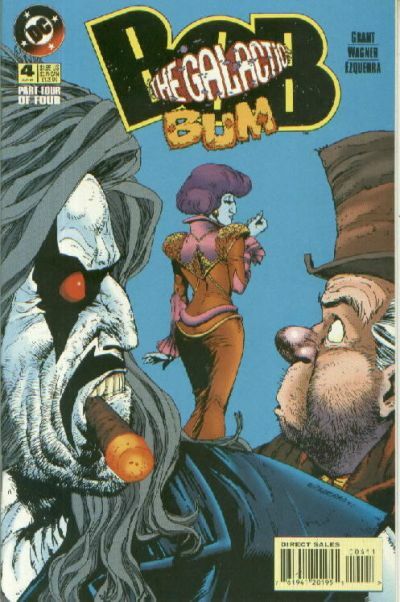 Bob the Galactic Bum is written by Alan Grant and John Wagner, the latter being the luminary of British comics responsible for co-creating Judge Dredd, though I know him best for his work on the Doctor Who Magazine comic strip. 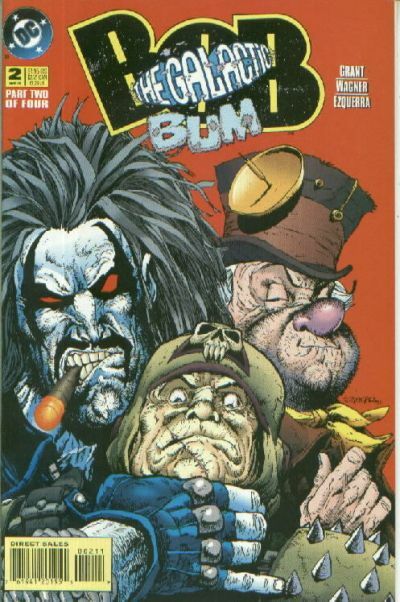 The artist is Carlos Ezquerra, Dredd's other co-creator. This story is no Judge Dredd adventure, however. It's a light comedy about a "galactic bum" named Bob, who seems to be a stereotypical British bum, complete with ratty top hat. Bob travels the universe with his companion Buck Fifty, who can only say "What?" and the story opens with him being picked up by an interstellar cruise liner carrying a prince. Bob is offended by the prince, who he calls a "piker" (i.e., a tightwad), but when Khunds attack the cruise liner, Bob, Buck, and the piker are the only ones left alive. Bob sees the opportunity to finally make his fortune, but that means getting Prince Gazza of Chazza back to his homeworld in time for the coronation while avoiding Khunds and Lobo. There's not a laugh on every page, but there are enough of them to make good fun. The Khunds are well done-- they're such anarchist brutes that their captain needs to reestablish his authority every single time he gives an order, and his crew is faintly embarrassed every time he compliments them-- and I enjoyed Bob's alleged duel with a guru on a higher plane. Plus the coronation traditions of Chazza (the previous monarch is executed by blind guards, which means many extra people die in the process) were amusing. 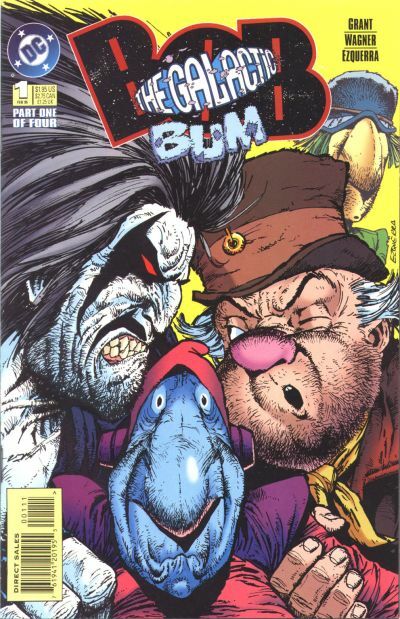 Like I said, Lobo was everywhere during this era, but Alan Grant is one of the better writers of Lobo, so he wasn't too annoying. Grant, Wagner, and Ezquerra are a solid comic team, and this is four issues of fun in the world of DC space.